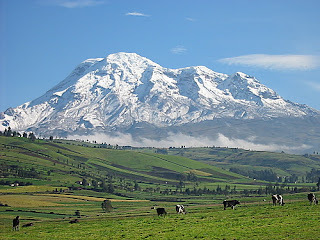 After our acclimatization hikes on Pasachoa and GuaGua Picincha, we had a great climb on our first big mountainm, Cayambe, and everyone summited! It was a long day, about 12 hours to the 18,997-foot summit and back to the hut. Conditions and the weather were good. We had a little extra work getting around some crevasses, but it wasn’t too difficult. Conditions on the glacier were good, and think everyone enjoyed the ascent a lot. It was very special enjoying the sunrise and the summit. I am happy to report that we also succeeded on Cotopaxi (19,348 feet) a few days ago. The ascent was seven-and-a-half hours to the top and then just 2 hours for the decent back to the hut. We reached the summit at about 9 am in perfect weather. 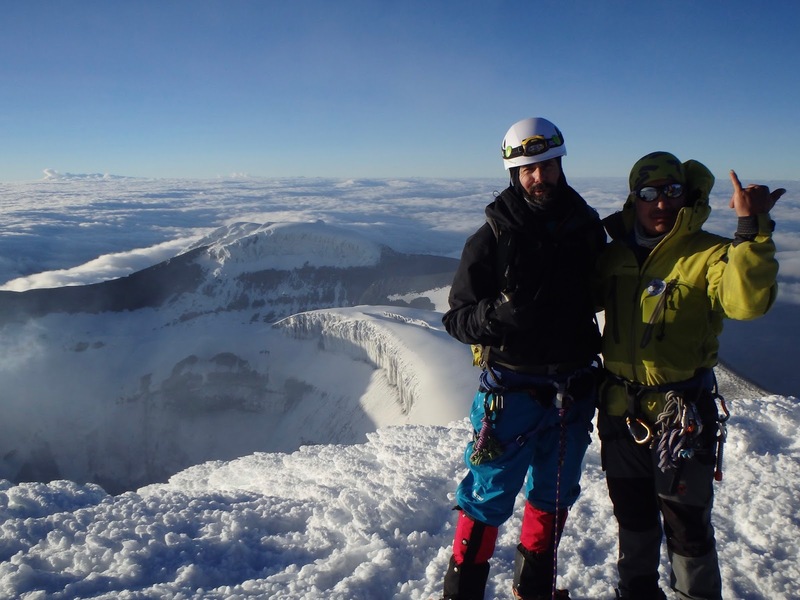 Everyone did well on the climb, and with good snow conditions, I think they found the climbing very enjoyable. It wasn’t just getting up this huge mountain. The climbing itself was excellent the whole way up! And we had another beautiful sunrise. Very beautiful. Our team members were pretty tired by the time we were done, but they were extremely happy. It was also so good to see that everyone did well with the altitude. The acclimatization schedule that we have been using for many years continues to work really well. After the climb we had some food at the hut and a little rest, and then headed down a short hike to our vehicle and then a drive through beautiful Cotopaxi National Park to the Pan American Highway. We drove north just a little and then west off the highway towards Illiniza Norte and Chuquiragua Lodge. 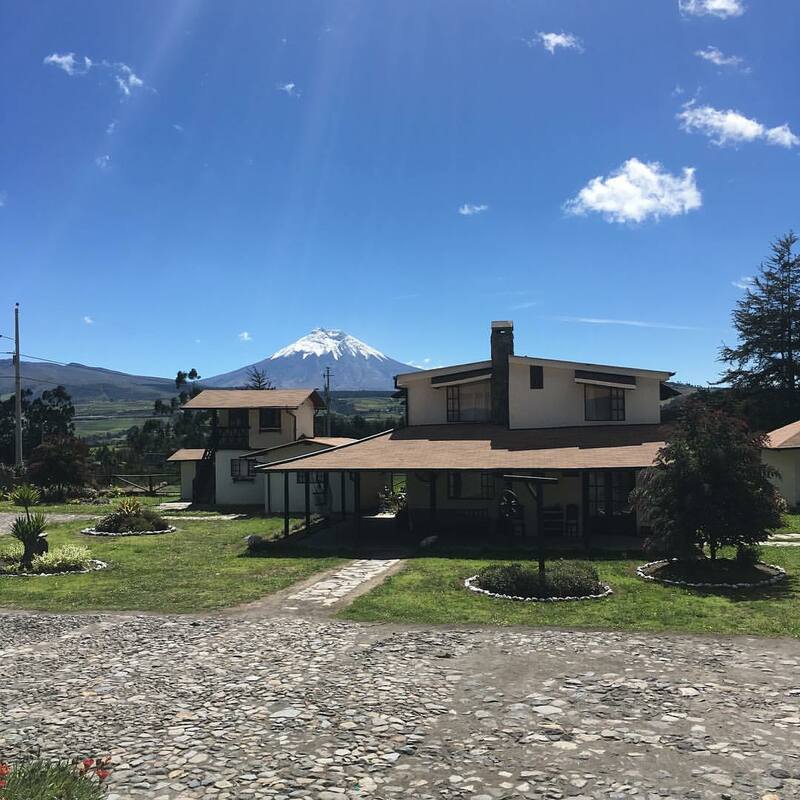 Chuquiragua Lodge with Illiniza Norte in the distance in clouds. Climbers Natalia, Shawn and Isaac, who were continuing no to Chimborazo stayed there for the night, while I drove Kwie-Hoa back to Quito as they were here for the ten days to climb Pasachoa, GuaGua Pichincha, Cayambe, and Cotopaxi. They had 100% success. The next day I picked up the climbers at Chuquiragua Lodge and we drove south towards Chimborazo, our final goal. We spent the night at Estacion Urbina, a nice lodge on eastern flank of Chimborazo. 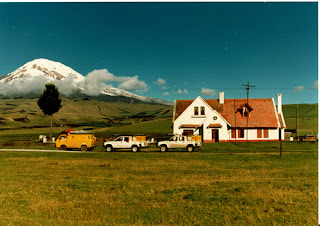 Estacion Urbina with the East Face of Chimborazo in the distance. The next morning, after a hearty breakfast we drove up to the hut on Chimborzo. We made an attempt in not exactly perfect weather – clouds and wind, but everyone did a great job going as far as possible. This was not going to be a summit day, but we made a good effort. Our high point was 19,180 feet on the 20,703-foot mountain. They was really good considering the strong winds we were facing all the time. It was a good challenge and we are proud of what we achieved. “After the climb we headed down to the semi-tropical town of Baños, which is in one of the river clefts that leads from Ecuador’s inter-mountain valleys down into the Amazon Basin. In a few hours we went from very alpine terrain of rocks and glaciers to the lush vegetation of Baños, with great greenery, palm trees, and hummingbirds! What a change! We are now in Baños enjoying the warm temperatures and the thick nourishing air. We’ve enjoy some good in-town activities as well as relaxing and recuperating from all the climbing we did this past week-and-a-half. Romel: OK – that’s the news. Thanks for reading about our hikes an climbs. It’s been a very successful trip and we’ve had a lot of fun together along the way.